Buy cantilever wall racks at Material Handling Solutions. Wall racks are designed to provide economical storage of long objects such as steel bars, pipes, tubes, lumber, furniture and carpet rolls. It offers an economical & efficient way to organize & store all the bulk items in your facility. Cantilever wall racks are constructed for industrial duty strength & safe support of heavy loads and they are easy to install. 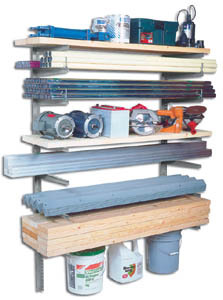 Our durable wall racks are constructed of Â¼â€� heavy gauge steel and feature 17â€� arms. Our starter kits consist of 2 uprights and 14 arms with fasteners. We also have add-on units available for long objects. We offer many other types of material handling equipment. Please check out our large selections of various types of lockers and display shelving to utilize your facility's space to the fullest capacity. We have a huge inventory of pallet racks and we can usually quick ship any order within 96 hours. Call us toll free with any questions you may have and one of our specialist will help you find what you are looking for.